There is no doubting that raw food goes a long way in providing immense nutrition. 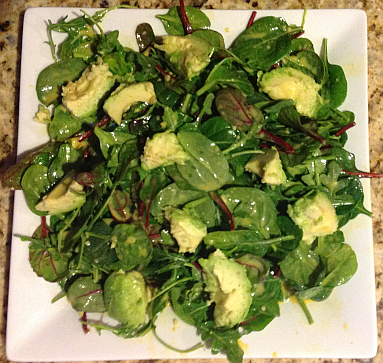 This salad is a great way to get a ton of nutrients: the right carbohydrates, good fats, protein and amino acids with enzymes, vitamins, and minerals, all teaming up to prevent cancer, eradicate oxidants, improve digestion, skin, and vision. This dish is a meal in itself, and, a great way to start the day. Salad...it's what's for breakfast! The leaves are simply Organic Girl Supergreens, (available almost everywhere nowadays), and the dressing takes just a couple of minutes whipped up in a mini food processor. This green feast has detox, regeneration, and target organs in mind. Meaning, if you haven't been eating any greens, ate or drank horribly the day before, and want to reboot the body and treat your liver, pancreas, and digestive tract to a ton of the right nutrients, this is the way to go. The Superfood mix combines all the right leaves: spinach, arugula, swiss chard, bok choi, tat soi.